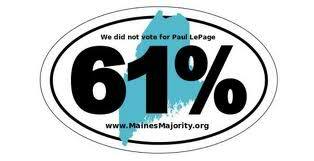 Portland, ME – Membership in a Facebook group called “We are the 61% of Maine that did not vote for Paul LePage” is expected to surpass 5,000 today. In just 6 weeks of operation, the group has become one of the largest online political efforts in Maine and spun off a bumper sticker campaign that will soon establish a solid “offline” presence on the state’s roadways. The initial outpouring of support prompted Korzen and Woods to launch a companion web site at www.MainesMajority.org earlier this month and to begin taking orders for “61%” bumper stickers. They upped their initial print run from 1,000 to 7,500 stickers due to overwhelming demand, and this week will fill orders for the first 3,700 pieces. MainesMajority.org is an independent effort to speak for the values shared by the majority of Maine’s citizens. We are not affiliated with any organization, candidate, or political party.